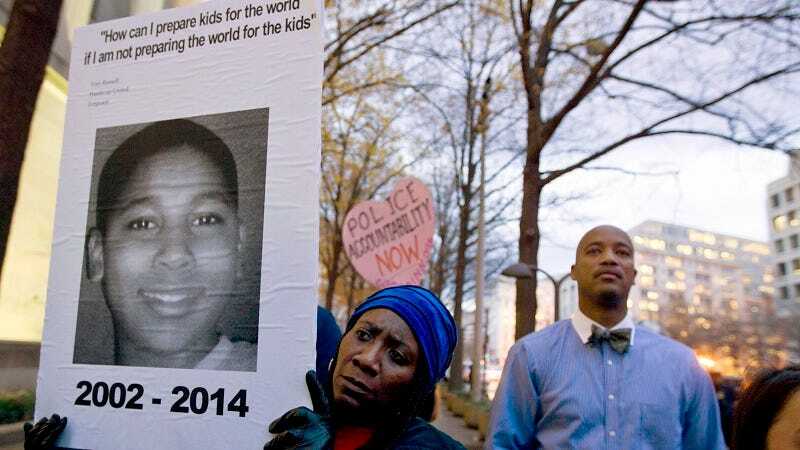 In a statement released earlier today, one of the two Cleveland police officers responsible for the death of 12-year-old Tamir Rice said that they believed Rice was much older than he was and they believed that he was carrying a weapon. In the statement given to investigators, Timothy Loehmann says that he saw Rice “pick up an object and stick it down in his waistband” outside of a recreation center. Loehmann says he yelled “show me your hands” as loudly as he could to Rice. The statement also claims that the police officers thought the suspect “appeared to be over 18 years old and about 185 pounds” and was pulling out a real gun. It was later confirmed that Rice was playing with a toy gun. Loehmann’s partner, Garmback, also issued a statement reiterating that he too believed that Rice was much older and carrying a gun. The shooting, which was captured on video, prompted local protests as well as calls for both Cleveland officers to be fired. An attorney for Rice’s family called the statement “inconsistent,” adding that “objective video footage contradicts the officers’ claims.” The video, the Post points out, has divided legal experts over whether or not the shooting was justified. A grand jury is currently considering whether or not to charge the officers.